A new public park on the Hudson River off West 13th Street in New York is set to feature entertainment organised by the biggest talents in showbiz led by Oscar-winning producer Scott Rudin. The New York Post says that most of the $130 million construction (AU $150 million) cost will be covered in a $100 million-plus gift from the Diller-von Furstenberg Family Foundation. The city is giving $17 million and the foundation is responsible for covering any extra costs. Pier 55 is expected to look more like an island than a pier, with it being placed 17.280 square metres offshore. It’s landscape will include small grove, open grass and areas for relaxing. There will also be two pedestrian walkways from a West Street esplanade leading walkers to free parking. Included within the park will be a 700-seat amphitheatre, which will host art events and live performances led by a team under the direction of Mr Rudin. The 2.7-acre park and performance area was designed British firm Heatherwick Studio and landscape architect Mathews Nielsen. The pier will replace the current rotting remains of pier 54, which is where the steamship Carpathia brought Titanic survivors 102 years ago. 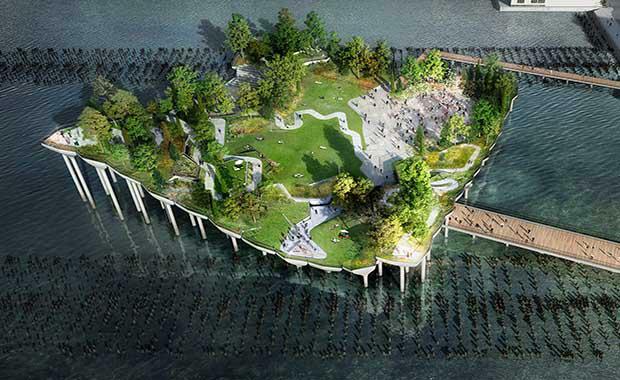 The park will be placed in 341 stilt-like concrete slabs, compared to the former pier’s more than 3,400. Its surface will rise from 1.393 square metres above the water in the lowest part, to 6.59 square metres in the southwest corner. The project for the pier is a partnership between the trust- the state body that manages the park from Battery Park City to 59th Street and the piers alongside it- and the foundation headed by the IAC media company chairman Barry Diller and fashion designer Diane von Furstenberg. The state is planning on donating $18 million to extend the narrow West Street esplanade 4.65 square metres further over the water. Hudson Park features 13 rebuilt piers and is home to the Intrepid Air and Space Museum, the Circle Line, as well as sporting facilities. Not-for-profit organisation Pier55 Inc. run by chairman Mr. Diller and vice chair Mr Rudin, will run programming for the park and fund day-today operations under a 20-year-lease with the park trust. Most of the entertainment held in the park will be free or low cost, with works by local and global acts being commissioned to create a premier venue for live music, dance, theatre, public arts and community events. A green light for the project is expected in early 2015, with construction also expected to begin then, and a completion date expected for late 2018 or early 2019.